Funakoshi Co., Ltd of Tokyo a leading distributor of bioreagents in Japan has been named the ITSI-Biosciences 2010 “Distributor of the Year”. This is the second time that Funakoshi is wining this distinguished and highly competitive award. Funakoshi Co., Ltd has continued to contribute to the growth of ITSI-Biosciences products in Japan. Criteria for selecting the award winner included a) overall number of items ordered in 2010, b) frequency of order, c) the different types of products ordered d) communication of feedback from customers to ITSI-Biosciences. To win the award, a distributor must place first in at least three of the four categories. Funakoshi placed first in three categories and second in one category, outperforming other international distributors. According to Dr Richard I. Somiari, President/CSO, “this unique partnership leverages Funakoshi and ITSI-Biosciences strengths to bring innovative life science products to scientists in Japan at a competitive price”. “It is a great honor to receive this award. We really hope that ITSI-BIOSCIENCES will dramatically boost their market forces in 2011. Of course, we will also exert our utmost efforts to establish their market in our sales territory as before.” says Shinya Ichikawa, Marketing Specialist, and International Business Department at Funakoshi Company. 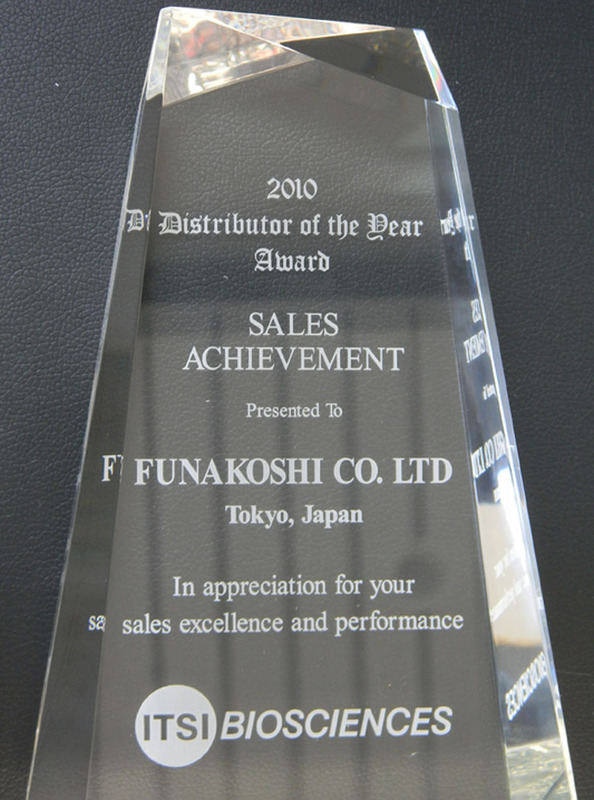 In appreciation of their efforts, Funakoshi Co. will receive an authentic 2010 Distributor of the Year award, a certificate and an additional 10% off on all orders placed with ITSI Biosciences during the month of March 2011.